Technically for us, it's going up, but I bloody love this song and I love Susanna Hoffs. Activate girl crush now Don Robot! (If you didn't know about mine and Heather's amazing invention of robot sewing assistants with interchangeable fantasy boyfriend characters...you do now). Last weekend, Mr S and I went to Liverpool to a wedding. I couldn't believe it when my lovely Twitter friend (and now REAL LIFE friend too) Claire sent us an invite. We were so touched and booked our train tickets straight away. I wanted to make Claire a gift as she's a fellow crafter and made me an honourable 'Nana'. That means we're little old ladies at heart who love nothing more than to sit on our sofas under a blankey or make something. 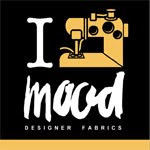 I know that Claire and Paul love tattoos so I found some awesome fabric online with a tattoo print. 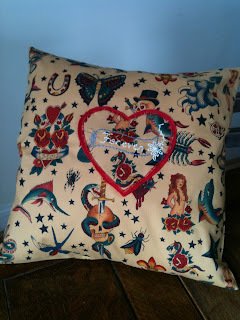 I thought I would make a cushion that she could keep as a memento from her special weekend. When I got married my sister knitted my ring cushion and it's on proud display in my sewing room. I love it, especially the thought and time behind it. So, here's what I made for Claire and Paul. It's an envelope style cushion with a 14" cushion pad inside. I used some red felt to make a heart on which i appliquéd a second heart made out of the main fabric. I found some cool iron on 'wedding' theme transfers from Eternal Maker and used the 'Forever' image. I then did some simple embroidery over the top in a very pale yellow and steel-grey thread, and added a little pearl bead in the centre of the flower. I stitched the heart onto the centre of the cushion cover using a basic straight stitch before I stitched up the sides of the cushion cover. Claire's wedding was so lovely. We got to the reception at six, which was held in a lovely tea room, Leaf, in the city centre. The decorations were beautiful. But, the best of all was Claire's dress. She looked so pretty and a real pin up star on the day! Her dress is from Vivian of Holloway - I think it's stunning. We had such a brilliant time at the wedding. We didn't know anyone but by the end of the evening we felt like we had been friends for ages. I also got to meet the lovely Kirsty and Natalie who I also know from Twitter. Kirsty was bridesmaid and looked awesome in the vintage vogue dress she made. Totally impressed. This is a bad photo/selfie of my outfit (not to mention taken in the bogs! 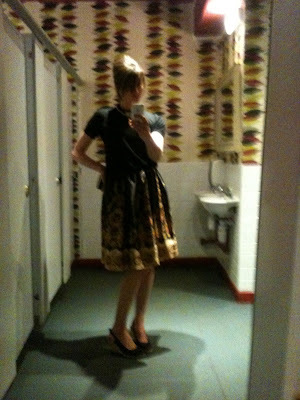 ), but I wore a skirt I had made some time ago from some fabric I bought in Vietnam. It's a slinky polyester but I love the print with the border at the bottom. I teamed it with a simple black knit jumper, necklace (which looks like a little peter pan collar) and wedges, oh and statutory beehive. Everyone was so warm and welcoming, and we danced all night to the coolest music. The DJ played some Elvis for me but he didn't have any Rod... whaaaaaaa? No Hot Legs...oh well, only 5 days to go until I see my blonde mod at the O2. Awwww Clare! You guys are the best and THANK YOU and Mike for 1. Travelling to see us, 2. Your beautiful thoughtful (way too much) gifts. The cushion is amazing and it in the living room, proud of place on the main sofa. It's so lovely to have you guys as friends. Who would of known after a RT from BUAV and a few comments a year and a half ago we would become Nana friends. That looks like an awesome wedding, I just wish there was a better pic of your outfit. So does my Hugh Robot who is temperately in Mark Ruffalo mode.